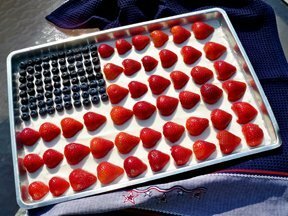 Add a patriotic look to your table this 4th of July with this Stars and Strips Fruit Dip. A fun and easy way to serve fresh fruit. The kid and adults both will enjoy dipping into this flag fruit dip. This flag decorated dip will be perfect for your 4th of July celebration. Find tips on how to create the perfect burger for your 4th of July. Find tips on preparing, grilling, and topping your burger. Here are some tips on how you can eat healthier at your 4th of July celebration this year.